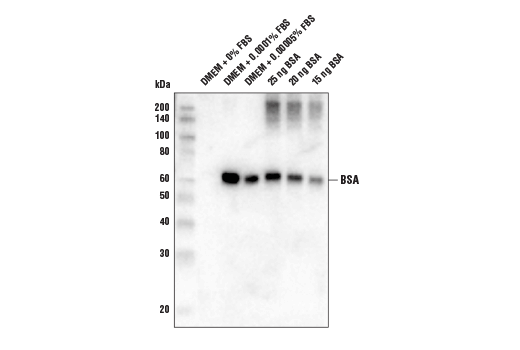 Western blot analysis of the indicated amounts of DMEM/FBS and BSA using BSA (D1C8Q) Rabbit mAb. Supplied in 10 mM sodium HEPES (pH 7.5), 150 mM NaCl, 100 µg/ml gelatin, 50% glycerol and less than 0.02% sodium azide. Store at –20°C. Do not aliquot the antibody. BSA (D1C8Q) Rabbit mAb recognizes total bovine albumin protein. The antibody does not detect human albumin. Note: For best results, avoid reagents that contain BSA. Monoclonal antibody is produced by immunizing animals with recombinant bovine BSA protein. Bovine serum albumin (BSA) is the most abundant protein in plasma. Albumin is predominantly synthesized in the liver and is a major transportation component for many endogenous and exogenous compounds, including fatty acids, steroid hormones, metabolites and drugs. It is also responsible for maintaining colloid osmotic pressure and may affect microvascular integrity (1). Quinlan, G.J. et al. (2005) Hepatology 41, 1211-1219.